I have translated the memoirs of an Iranian woman who spent eight years as a political prisoner in her homeland before being released in 1999. Her arrest, torture, experience of several prisons and many prisoners, resistance to indoctrination, and ultimate release are all part of an account that was published in two volumes by the French publisher, Khavaran, largely for Iranian émigrés. I believe the courage and endurance of Fariba Sabet deserve a wider audience, and that the infamous tactics of the Iranian government, secret police, and prison officials (which included the killing of 90% of their political prisoners in 1980’s) ought to be more widely known. Recent events in the Middle East have focused attention on Iran, generating interest in the plight of its people, but even those who are not interested in politics will, I’m sure, be gripped by the stories of women a regime set out to break or drive mad . . . many of them mothers who were, for years, expected to rear their toddlers in prison. 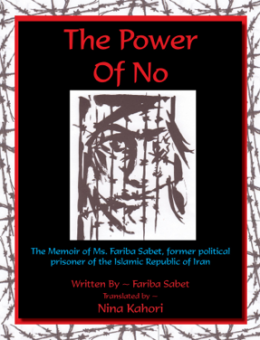 I have endeavored to translate the Power of No in a way that western readers will be able to relate to, and I have done so with the approval of Fariba Sabet. Considerable pruning has made it possible to combine the original two volumes into this translated memoir.